A more complete set of specifications for the future Treo 850 have now surfaced and these point not only to a rather high-end device for what’s inside but also a very elegant Palm smartphone on the outside. In fact, the Treo 850 promises to become one of the thinnest Touchscreen + Keyboard smartphones in the world (see below) when it is released (hopefully at the end of July) thanks to being only 14mm thick – a full 25% slimmer (4.6mm less) than the already small Palm Centro. 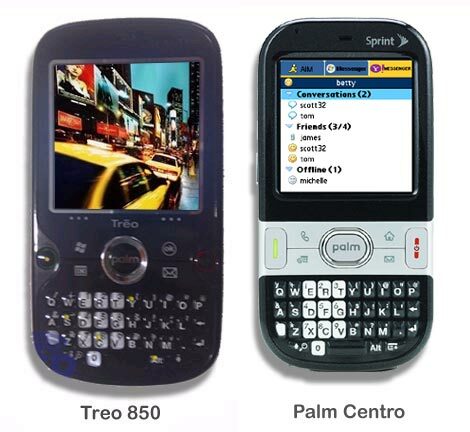 The image comparison below shows the Treo 850 roughly to scale with the Centro. The first measuring D14mm x W60mm x H113mm compared to the D18.6mm x W53.5mm x H107.2mm of the Centro. Thus, aside from its slimness, the Treo 850 is 6.5mm (12.5%) wider and some 5mm (5%) longer than the Centro which guarantees both a larger screen and keyboard that business users will demand. I also expect the Treo 850 to weigh only between 100–120 grams (some 33% less than the existing Treo 750 that it replaces). Overall I have to admit that the more I learn about the Treo 850 the more I like it. Its looks are very appealing with the slick black body – one that now happens to be ultrathin and ultralight – and there’s absolutely nothing to fault in its high-end specifications. I reckon that it may very well prove to become one of the most successful Windows Mobile Palm smartphones to date when it is released at the end of July. Separately, the Treo 850 also represents the single largest and most significant design “jump” that Palm has made in quite a while and may finally be indicative of a completely new design culture at the company – one which will hopefully deliver a range of stunning devices running the new NOVA operating system in 2009. It’s certainly encouraging and refreshing to see Palm slowly but surely moving on the right track again. thank you Palm. Thank you for putting all of this effort into your Windows phone instead of the Palm phone which put you on the map in the first place. I'm actually hoping this modern device will be Platform Independent. Meaning, that "Nova" (when it arrives) will run on the same hardware. Can I take the square touch screen as an indication? So Palm Inc. is planning to go head to head with RIM, Apple, LG. I have to admit the release of the Palm Centro was a success but it took for ever to have the avilability to purchase. I hope the same mistake is not made again. However RELEASE for July makes it late. Apple is comming with some new iphones possibly Iphone nano, the size of a small Ipod with no wi-fi or 3G speeds on June 9-13. Blackberry will be anouncing a Blackberry Storm which should be touch screen phone. The near future is heading to touch screens. Seriously nice specs (in the current market context, anyhow). Seems like these specs keep getting slightly better every time they're leaked. That's a bit dangerous if anyone in the audience is generating false leaks, as it raises the bar for the manufacturer every time. with a July release date, contracts I'm sure are already or nearly negotiated for the supply chains. Hope that Project Nova doesn't just accomodate those specs. By the time that's scheduled for release, it better accomodate those specs and a few more inventive features. Prognostication's a difficult game for engineers to play, though. Any word on pricing yet? I was thinking of the 3G Iphone to replace my Treo 750...but I might get the 850 instead...now that I have skyfire web browser I am really happy with my WM phone. Has Palm abandoned its own OS for future development? I gave up a Tungsten to go to a single device; the 680 isn't perfect but it's a lot better than any device with Windows Mobile. Sure I'd like a smaller, thinner phone/PDA but not at the expense of the Palm OS. when does it come out and for who? GPS and WiFi is wonderful, but given this is for Windoze, that's not news. WiFi for Palm OS, that's news. Hey Palm, hurry up, our patience is wearing thin. And what's with the SD slot under the battery? Gee, can you make it any less convenient? Nothing says "mobile" like fumbling to swap expansion cards by removing the battery cover, removing the battery, swapping the cards, replacing the battery, replacing the cover... so very elegant indeed, sure beats a simple slot I can insert the card into. Maybe I'm being picky or petty, I'll concede. I guess I'm just getting tired of getting my hopes up with each announcement that is NOT for Palm OS, as though I really care about Windoze. Why are you reluctant to talk about the 32MB RAM?? Wait..is Palm realy serious about it?? He also mentions hopefully by the end of July and the Treo 850 will be a GSM-only model for AT&T. tgwaste - I certainly don't think that Palm has been putting _all_ its efforts in Windows Mobile. It's simply that we'll have to wait a little while longer until devices running the new NOVA OS are released. Stefan - When the new NOVA OS devices are released they will undoubtedly run on this hardware at a minimum and possibly on an even better hardware platform. Alex E - Yes, the Treo 850 will come out a bit late but it will still be at the high-end of any competing Windows Mobile smartphones on the market and also well positioned to take on both BlackBerry and Apple. random9q - I still can't tell for sure if GSM will be released before CDMA but it's likely that they will both be released within a couple of months of each other at the most. Eric - no word on pricing but I would guesstimate that the Treo 850 will be priced at around the $499 mark. LindaIq - Palm is working hard to unveil its next generation NOVA operating system and new devices are due to be released in the first half of 2009.
jhoravi - at this point everybody seems to agree that the 32MB of SDRAM is probably an error and that the real number is actually 132MB. If it still needs an external antenna thats not progress.I have a 680 with Tom Tom, and an external antenna. Not a bad solution until you see/use a phone with built in GPS. But it sounds like it won't be out until almost two months after the iPhone 2 debuts in a couple weeks. Nova stars don't die. They only glow brighter. I wish Palm the same. Oh, please, please, PLEASE make a Palm OS phone, despite the report here on Treonauts from an interview with Palm CEO Ed Colligan where he "essentially stated that 1) all future Treo smartphones will be running Windows Mobile...; 2) the only devices that will continue to run Palm OS will be Centro smartphones targeted at the consumer market and 3) the new NOVA OS (Palm 2.0) based on Linux will power a next-generation of Palm smartphones under a new brand (Quattro?) targeted at the 'prosumer' market." Instead of the little software and design tweaks, how about 1. A Ruggedized Treo ! Every smartphone i see is made so very delicate. 2. Bluetooth that "docks" on the phone, tucked in a docking/charging station. It's out, it's on, it's in it's charging ! If it still needs an external antenna thats not progress.I have a 680 with Tom Tom, and an external antenna. Not a bad solution until you see/use a phone with built in GPS." okok, its out. i just ordered mines yesterday. now i am having a hard time finding accessories! it just came out yesterday july 13 and i bought it the same day! Any update on the release of the 850?